If your mind is set for wearing your IWB holster inside the waistband of your pants, you need to get yourself a tuckable IWB holster. 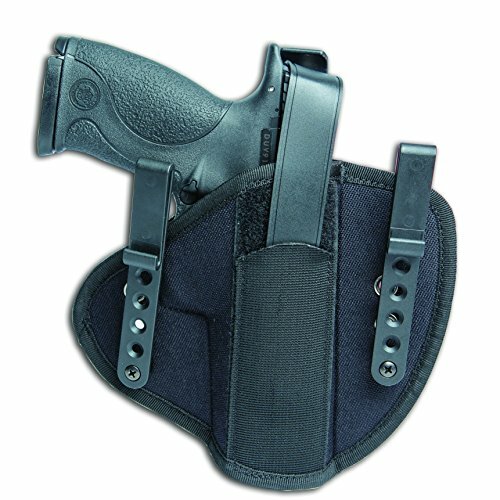 This type of holster comes with a clip so you may fasten the holster to your belt. This way you may tuck your shirt over your gun, between the attaching clip and your holster. Basically, both your gun and holster are going to be covered by your tucked-in shirt. It means you may go on and walk carefully on the streets as your gun isn’t showing at all. You still need to follow some fundamental steps if you want to wear your tuckable IWB holster, not only without showing it, but also comfortably and safe. Keep in mind that your holster is going to be visible on your belt, no matter how great it is. Don’t forget the imprinting of your gun as it’s not impossible for your gun to imprint, no matter how many layers of fabrics you put on. Concealment is essential on a tuckable IWB holster and a lighter fabric seems to do the trick every time you wear the shirt outside your pants, and not tucked. Your shirt should be long enough to hide your gun, no matter if you sit down or walk. There’s no point in wearing a tuckable IWB holster if it’s not comfortable. 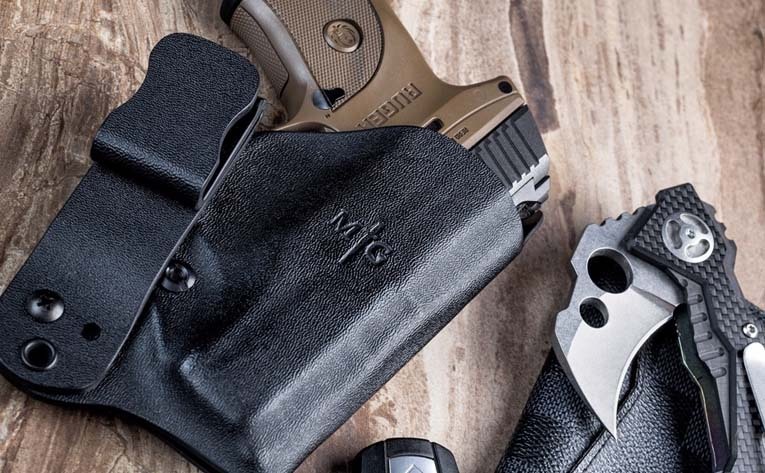 A minimalistic design, a low profile on your holster should mean a lot for your comfort, but the design and the materials on your holster play a big part when it comes to comfort as well. Tuckable IWB holsters are made with concealment abilities, more than anything else. They are not that much about speed, so remember that when shopping. It may take more than 2 seconds to draw and shoot when using a tuckable IWB holster, but safety comes this first for this category of holsters. Hey, you may even find it difficult to re-holster at times when using a tuckable IWB holster. Take your time and keep in mind that you need to stay alive, more than anything else. You don’t need to come back home empty handed when shopping with just a few bucks. 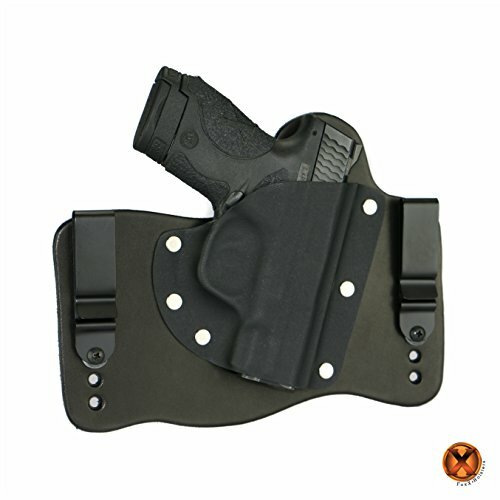 The Tuck Tuckable Inside The Pants IWB Holster is well made and form-fitted for some gun models. The holster is made with Cordura Nylon and has a tuckable design for deep concealment. It’s very comfortable for concealed carry and offers good concealment every time. The holster feels soft and doesn’t pinch your skin. It’s ready to wear right out of the box and doesn’t need any time to break in. It has a low profile and presents minor printing. It’s lightweight and comfortable to wear all day long. The tempered spring steel belt clip is tough (too tough, according to some) and keeps safe and secure your holster. The draw is easy and the holster is reliable. All in all, for few bucks, you get a good holster that hides well and conceals your gun- which is what you want on a tuckable IWB holster. Let yourself surprised by a low priced IWB holster that works so great as a tuck able holster like the DeSantis S and W Shield Sof-Tuck Holster. The inside the pant holster is well made with tan leather and gets softer the more you wear it. The suede is soft, doesn’t slip and is pretty durable. The top of the holster is reinforced with saddle leather, for easier re-holstering. The holster is versatile and it’s designed for many gun models, right or left handed use. The holster sits very low and it’s minimal design minimize printing of the holster. The J-hook is very effective and the holster is well made. 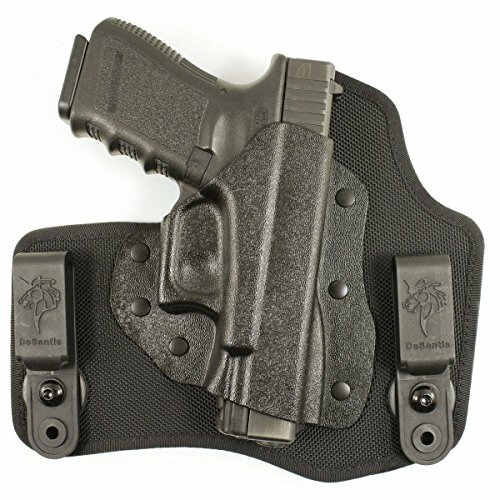 The fact that is tuck able it’s not the only thing we like on the holster as it presents several other good things. The holster comes with an adjustable can’t and you may wear it strong side, cross draw or on the small of you back. The draw is easy and the retention is good. The holster doesn’t dig nor pinch your skin. It stays put and it’s easy to use. Despite the minor issues, the holster is a good option to have when in need. We need to come clean about this next holster as we kind of sit on the fence with it. The Uncle Mike’s Tactical Inside-the-Waistband Tuckable Holster sure brings many good things on the table, but it comes with some minor drawbacks as well. Checking the price though makes us realize that, in the end, for the little money we pay, we got a pretty good deal. The holster is made with Kodra nylon and soft-knit fabric so it’s comfortable and ready to take the use for quite some time. For instance, the ambidextrous design of the holster is a big “yes” that helps you get the right holster, even if you’re a left handed user. The holster is not only easy to use by any of us, but it’s also versatile as it may be worn in various positions. Either you go with a cross-draw or on small of back drawing, the holster is easy to use. The adjustments of the holster are also important to mention and the holster presents 5 adjustment points on clip and 3 on holster. The belt clips are also adjustable, making the holster more reliable in various situations. The stitching and the welds are well made and the holster stays on, no matter how much you move. Due to its versatility and built, the holster is used by citizens and law enforcement professionals as well. As long as you are aware of the fact you’re not getting a high end holster, you’re good to go with this reliable, comfortable holster with ambidextrous design. First thing that pops to eye for many when talking about the DeSantis Invader IWB Tuckable Holster,Glock 43,Right Hand is the fact it’s made here at home in our USA. The holster is much more than that though so join us when checking the details. 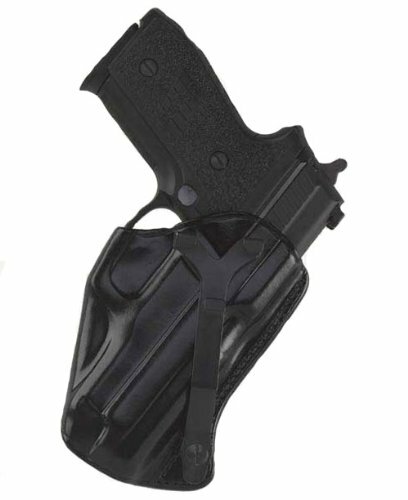 The holster is durable and form-fitted so it gives a nice, snug fit for your gun. Either we talk about a Glock 43 or a Springfield XDS, it’s very likely that you find the one especially made for your gun. The holster is made with long lasting neoprene, ballistic nylon and some other materials. 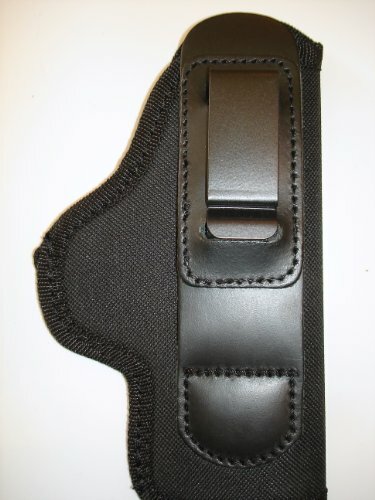 A thermo-molded Kydex sheet creates the special form and the holster is not only durable, but very comfortable to wear. The neoprene backing has a nice touch feel and is long lasting. The C-clips on the holster are strong as they are made of glass-reinforced nylon. The design and built match the rugged construction of the holster. The holster comes with a hex wrench so you can easily make the adjustments you need. The retention is good and the holster conceals efficiently your gun. We like the holster as it doesn’t dig into your skin and feels rather nice against your skin. It’s easy to use and keeps safely your gun in place. The holster is well made and has a durability feel to it. The minor cons don’t cancel the overall quality of the holster that stands out with its durable built and reliable performance. The FoxX Holsters Smith & Wesson M&P Shield 9mm & 40 IWB Hybrid Holster Tuckable is a hybrid holster that is not only reliable and strong, but also tuckable and safe to use. The holster is made with leather and Kydex so this means you get a nice fit to your gun, for a very long time. 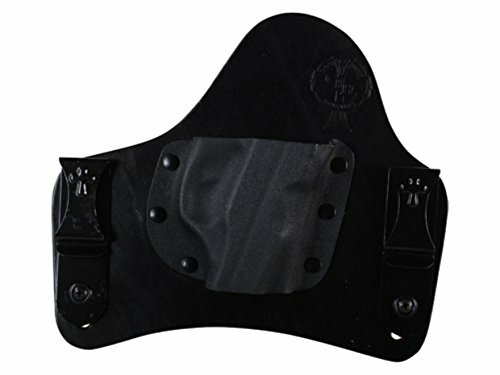 The holster breaks in rather fast and the holster becomes more comfortable with each wear. 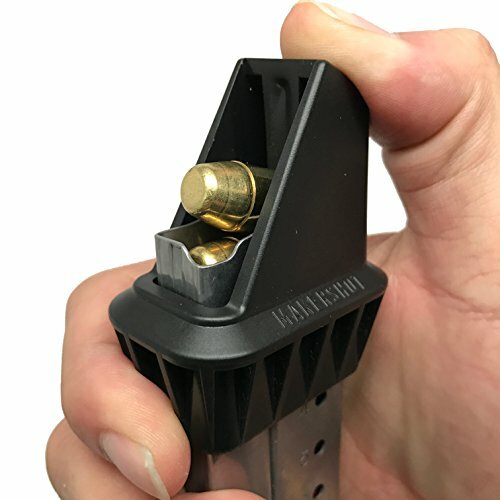 You may set the ride height and the forward cant, so the adjustability of the holster is another good thing to consider. The concealment is easy and the tension is right. The holster has a low profile and it hides very well, with little to none printing. We like the rugged built of the holster and the fact it stays in place, no matter how much you’re moiving. The black steel belt clip is tough and doesn’t let the holster move. Your gun gets a snug fit and it slides nice and easy in/out of the holster. You get easy access to your gun and the drawing is always quick and easy. The holster is very well made and the good quality materials sustain the durability of the holster. Nevertheless, for a fair price, you get a reliable, tuckable and long lasting holster that is made here at home in our USA. It’s difficult to talk about the Alien Gear Holsters Cloak Tuck 3.0 IWB Holster as we never know what to begin with. There are many things that explain the popularity of the holster and it’s flexibility and the ability to be tuck able are quite important. The holster is made with neoprene so the holster is very flexible and stays safely in place, no matter if you move/jump or simply sit down. The neoprene helps the holster remain nice and dry all the time as it wicks moitsure efficiently. Not only that your skin is protected, but also the gun gets protected against the corrosive perspiration. The thermolelastic polymer takes good care of your gun and its nice finish. The adjustability of the holster is another reason for its popularity. 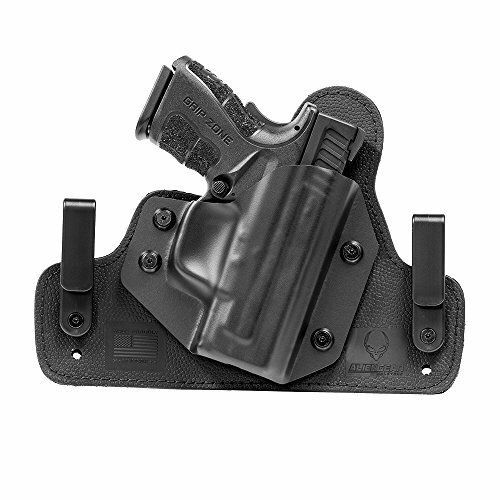 The holster comes with adjustable ride height, cant and good retention. We like how the holster dissipates the weight of your gun, increasing your comfort throughout the entire day. The list of reasons has to include the universal shell system that lets you swap shells, according to your gun model. You don’t need another holster ever again as this one sure fits all types of guns. Big guys like a lot the holster as it doesn’t dig nor pinch your skin. The belt clips match the rugged built of the holster and sustain its durability. Nevertheless, for a small price, you get a reliable, tuckable and highly versatile holster that may serve you forever and ever. Comfortable and giving a great fit to your gun, the Bianchi Allusion Series 135 Suppression Tuckable Inside the Waistband Holster is not only tuckable, but also dependable and efficient. The holster is designed for deep concealment and keeps your gun safe and protected at all time. It’s made with leather and synthetic material, resulting in a long lasting, comfortable and ready to use out of the box holster. 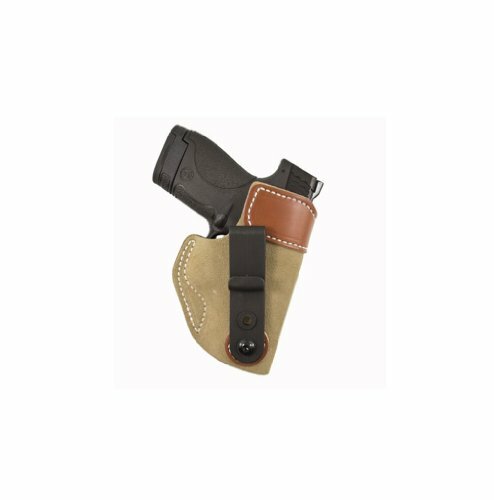 A premium grade full grain leather wraps around a thermal-molded synthetic core, making the holster more durable. The holster presents also foam and anti-microbial mesh outer, which increases your comfort, minimizing risk for unpleasant smells and germs. The holster wicks moisture, keeping your skin fresh and cool all the time. We also need to notice the C-clip belt attachment that helps you tuck in your belt, with reliable retention on the belt. The liner sustains a fast draw and easy re-holstering, with minor estate on the belt. The retention is great thanks to the padded liner and the trigger-guard detent. The concealment is impressive also. The holster fits belts up to 1.5” wide and is very well made. The minor flaws aren’t deal breakers for us and we like the holster as it’s safe, comfortable and breathable. Especially made for your gun (the holster is form-fitted for many gun models), the Talon Tuckable Concealed Carry IWB Leather Holsters is not only comfortable, but also long lasting. The tuckable holster is made with Hermann Oak American Steer Hide leather, which is of great quality. The durability of the holster comes though not only from the impressive quality of the leather, but also from the craftmanship, as the holster is very well made. Unlike most of leather holsters out there, the Talon Tuckable gets soft quite fast and doesn’t need a whole week to fully break in.You may know by now, but the more you wear a leather holster, the better it gets. The low profile and the nice design hide the holster rather well, which is why you got yourself a tuckable holster in the first place. Your gun is protected and well concealed and the holster doesn’t shift or move when you’re on the move. The steel clips are strong and keep holster in place. The drawing is easy and the retention is great. The holster is very well made and it’s a great choice for the law enforcement due to its “No Bull Guarantee”. The minor drawbacks aren’t deal breakers for us and the holster still stands as a great tuckable option when in need. 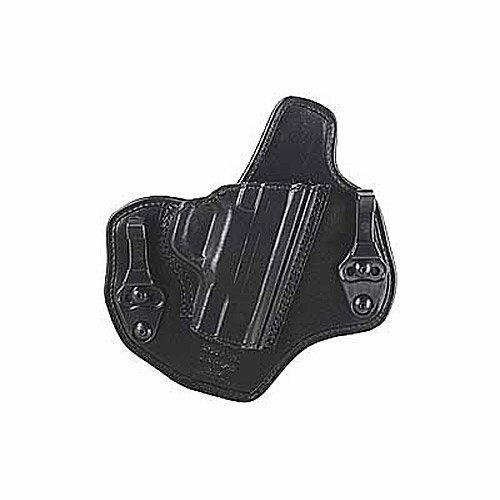 The very slim tuckable design on the Galco Skyops Holster for 1911 3 1/2-Inch Colt, Para, Springfield (Black, Ambi) recommends it as a dependable option whenever in need. The holster is made with premium saddle leather and it’s designed and built to take the intense use for a good amount of time. The most interesting and important asset of the holster is the patented injection Y-hook that changes everything when it comes to concealed carry. The Y-hook grips safe and tight as a full loop, but hides very well on your belt. The holster fits a great variety of belts, from 1” to 1 ¼” width and is a good option for semiautomatic pistols. Another thing we like a lot on the holster, increasing its versatility is the ambidextrous design which means you don’t need to worry if your placed your order right. The concealment is good and the holster is quite flexible. The 3 o’clock position seems to be working the best, but may use successfully the appendix style as well. The holster is safe and secure and may tilt and dive, just the way you need it. It gives a good fitting to your gun and lasts for a long time. The holster is very well made and looks very nice. For the money you pay, you get a durable, flexible, tuckable holster that you may rely on in so many situations. The more you are willing to pay, the more you get from your holster. The CrossBreed Holsters SuperTuck Concealed Carry Holster sure fits the description and there are many things you’re paying for when getting this holster. The list of reasons begins with the manufacturing of the holster that is handmade with cowhide leather. Therefore, the holster fits so nicely on your gun and feels comfortable for a very long time. the leather combines very well with a Kydex pocket so the holster gets double the durability and ability to take the most challenging experiences. The several good things on the holster include also its versatility as the holster is designed to fit a nice variety of Glock models (17, 22, 23, 25, 31, 34n and 35) or other type of guns. We’re not going to forget about the adjustability of the holster as you may get the settings you want for the ride height or the carry angle. You’re going to find the steel belt clips comfortable (they are modular) and tough. They match the durability of the holster as they are powder coated. The retention is good, the concealment is great and the audible click informs you when your gun is safely holstered. What would you like more? Well made and comfortable, this may be the last holster you’re ever going to be buying. What’s a holster without its minor flaws? All things considered, we like the holster for its great built, quality of materials and reliability.